A couple of hours ago HEXUS published one of the first reviews of the new Corsair Hydro Series H150i Pro RGB cooler. That’s not all we have to share with you with regard to Corsair products unveiled at the CES 2018 though as the firm has provided us with some details about the “world’s most amazing PSU,” the Corsair AX1600i. First of all, Corsair wants to admit that the AX1500i is no longer the pinnacle of enthusiast PSUs. 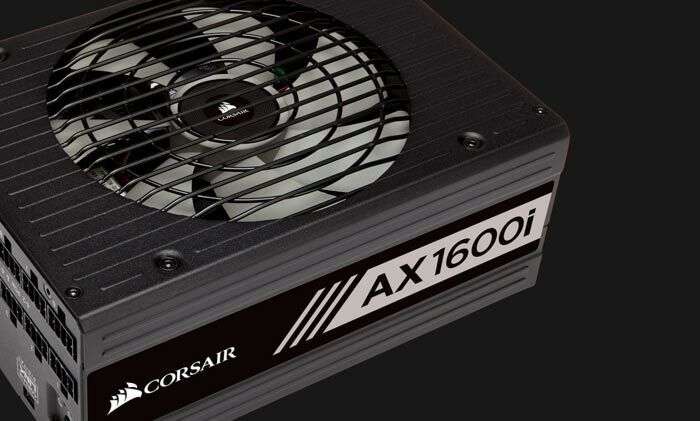 The firm didn’t stand still and let a competitor gazump it though, it designed a PSU that improves on the AX1500i in nearly every important metric, and of course it supplies an extra 100W… The new Corsair AX1600i is said to offer superior efficiency, ripple suppression, noise levels and voltage regulation. Those things are aptly illustrated in the comparison chart below. One further point of note is that the AX1600i is also physically smaller (20mm shorter – full dimensions are: 200mm x 150mm x 86mm, weighs 2.65kg). A major factor in improving the already capable AX1500i was the use of Gallium Nitride (GaN) transistors throughout the design. 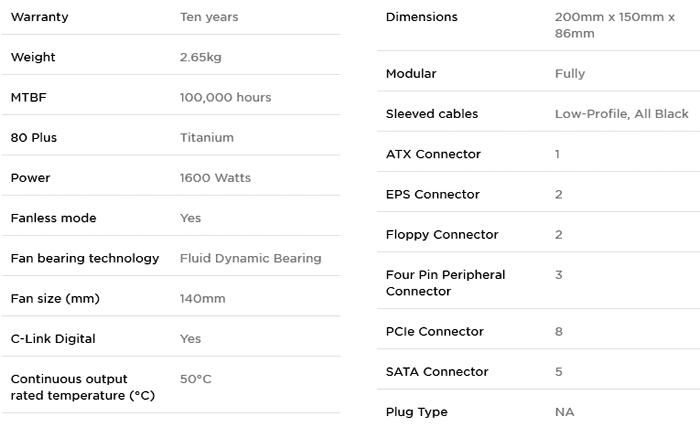 Traditionally silicon transistors have been used but GaN facilitates greater scale reductions – a more compact PSU, explains Corsair (GaN has approx 40 per cent better power density than silicon counterparts). Furthermore, GaN has lower resistance and faster switching resulting in less switching losses, and less capacitance. By using GaN (Gallium Nitride) components in the totem pole PFC circuit, efficiency is increased, reducing the need for the larger heat sink required for typical Si (Silicon) parts. GaN parts are also smaller than Si parts. The AX1600i features an advanced control architecture to produce outstanding dynamic response. It features a true digital engine that provides superior on-the-fly performance optimization across the full operating range while maintaining stable operation. The sophisticated electrical design, incorporating advanced hybrid digital control and state of the art magnetics delivers extremely high energy efficiency (over 94%). 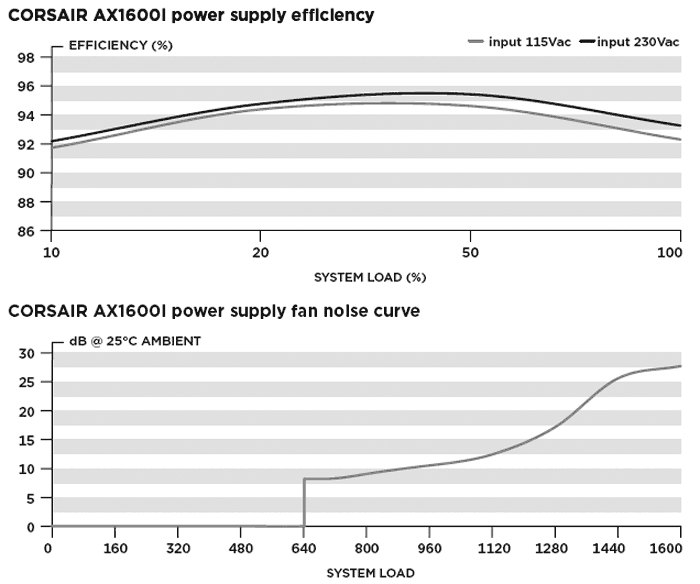 Due to its digital design, the AX1600i delivers exceptionally stable power over the whole load range and automatically compensates for DC output cable voltage drop, ensuring tight DC output voltage regulation without the ripple/noise, transient response, and converter stability drawbacks associated with conventional power supply designs. The AX1600i features individual DC-DC regulation for 3.3V, 5V and 12V rails, and secondary side synchronous rectification, utilizing MOSFETs that have lower losses than the conventional output rectification schemes. An advanced 4-layer modular connector board PCB ensures a better ground return plane, lower resistance and low voltage drops. This, combined with circuit trace optimization and advanced filtering techniques, helps to minimize ripple and noise. As with its predecessor, Corsair Link software has great utility value when used alongside the AX1600i. Beyond the common-or-garden efficiency, voltage, and fan speed monitoring, logging (Excel compatible file export), and control, Link can be used to switch from single- to multi-rail operation, and adjust over-current protection points on each connector. As this is the new pinnacle of is enthusiast PSU range Corsair wanted to add some pleasing aesthetic accessories. For example there are swappable magnetically attached Corsair motif labels in red, white, and blue (you can only use one at once) which is intended to make the PSU work better with the colour scheme of your PC. The Corsair AX1600i is available immediately at the same price as its predecessor here in the UK, £409.99 (and it costs $449.99 in the US). 71 QOTW: What wattage is your power supply? Ok… so now that 3way or 4way SLI is not a thing anymore, who would need all that W power? miners? Its price is the most bigly too. People who use the gpu's for more than gaming, ie someone like me who could use the gpu's for 3D rendering for example…not that I'd take that approach because it would be quite expensive. Noone really needs a PSU with that many Watt. Also, what people often forget is that high wattage PSU are absolutely terrible at low wattages. Terrible as in terribly inefficient, considering most PCs idle away most of the time. But of course, this is just a halo product for the MOAR POWAH crowd. To be fair if a PSU is 80Plus Titanium certified it's 90%+ efficient minimum across the board.